. Gion Festival begins 祗園祭（ Kyoto .
. Franz Kafka カフカ　フラン Birthday Memorial .
. Independence Day - USA .
. Memorial Day for Madame Curie キュリー忌 .
. Memorial Day for Eisai Zenji 栄西忌 .
. Sumiyoshi Shrine Rice Planting Festival 住吉の御田植 .
. Star Festival 七夕 Tanabata .
. shoosho 小暑 Shosho, small heat .
. Haguro Festival 羽黒花祭 Festival of the Three Mountains of Dewa .
. Nippon fukushasai 日本福者祭 canonization day of Japan .
. Fire Festival at Nachi 那智の火祭り Kumano .
. Paris Festival パリ祭 . Middle third of the year begins 中元 chuugen, Chugen presents .
. Miyajima Itsukushima festival 厳島祭 .
. Ramadan begins in the year 2012 . It ends on August 18, 2012.
. Ocean Day 海の日 umi no hi .
. Belgian National Day - Fête nationale de la Belgique .
. taisho 大暑 great heat .
. Tenjin Festival 天神祭 for Sugawara Michizane .
. Memorial Day for Akutagawa Ryunosuke 芥川 龍之介 .
. Oyama festival 大山祭 at shrine Afuri Jinja, Kanagawa .
. Feast of Saints Peter and Paul 聖ペトロ・パウロ祭 .
. WKD : July - a Haiku Month .
. WKD : World Days in July .
. Ceremonies, festivals, rituals - July .
. Memorial Days of Famous People - July . During the main festival in summer, many people come to get in contact with their lost loved ones through the blind Itako shamans. The Osorezan access is open from May 1st to the end of October. 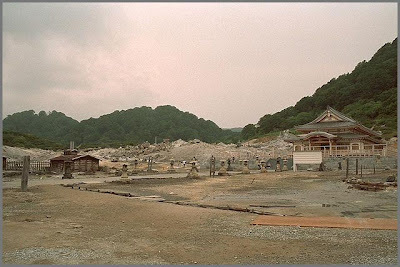 I visited Osorezan many years ago. I will try to tell you more about our encounter with the Itako in my report below.
. The Hot Spring (onsen 温泉) at Osorezan .
. Look at more of my photos ! 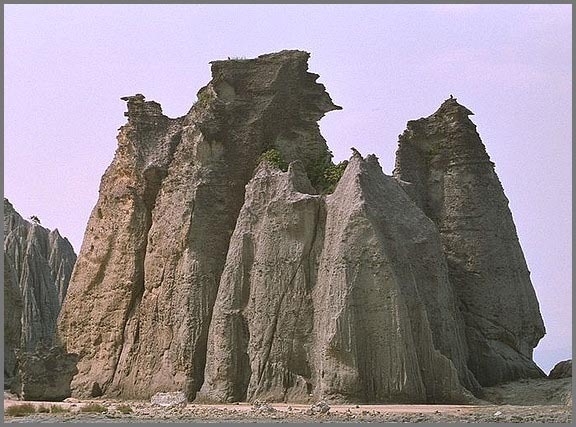 is a region in the center of remote Shimokita Peninsula of Aomori Prefecture, Japan. 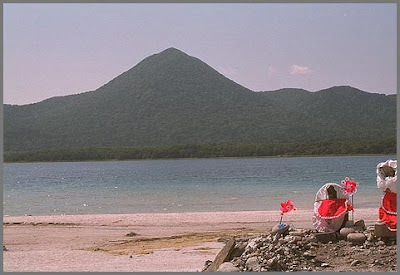 According to popular mythology, Mount Osore (literally "Mount Fear") marks the entrance to Hell, with a small brook running to the neighboring Lake Usorisan that is equated to the Sanzu River, the Japanese equivalent to Styx. 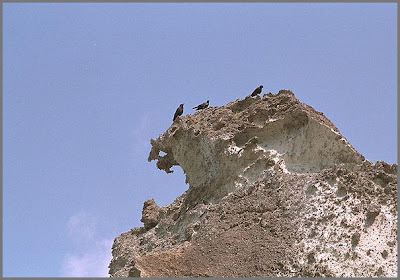 The reputation is not surprising, given that the very volcanically-active site is a charred landscape of blasted rock filled with bubbling pits of unearthly hues and noxious fumes. The Bodai temple (菩提寺, Bodaiji) presides over it all and organizes the area's main event, the twice-yearly Itako Taisai festival. The grand festival is held over a period of five days beginning on July 20. In a ritual called kuchiyose (口寄せ), blind mediums known as itako claim to summon the souls of the dead and deliver messages in their voices. 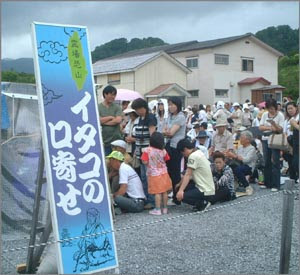 People lining up for the kuchiyose. "Family resemblances: Memorial Images and the Face of Kinship." Japanese Journal of Religious Studies 31.1 (2004): 141-62. "The Bloodstained Doll: Violence and the Gift in Wartime Japan." Forthcoming in the Journal of Japanese Studies. the story goes that between life and death there flows a river. 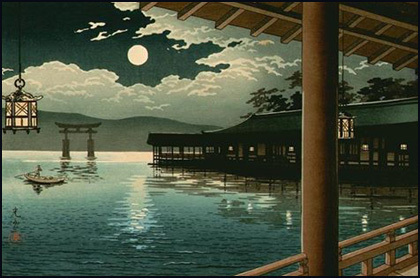 This river is called Sai no Kawara 賽の河原 (translated it means Sai [Childrens Limbo; Limbo means a region on the border of hell or heaven, serving as the abode after death of unbaptized infants.] Kawara [riverside]. 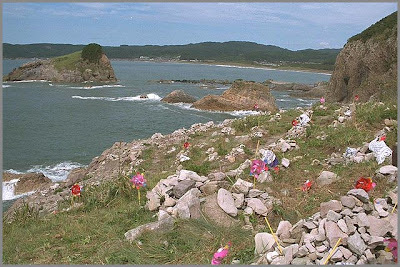 According to Shinto belief, children do not go to heaven or hell, but the souls of the dead babies play on the banks of this river, Sai no Kawara. And one of the things they have to do as their Duty (penance) there, is to stack up pebbles, and build little towers. However, while doing so, a naughty, horrible devil usually appears who disturbs their playing, breaks their towers up, and scares them. And, it is here where the long sleeves of Jizos robe comes in handy. 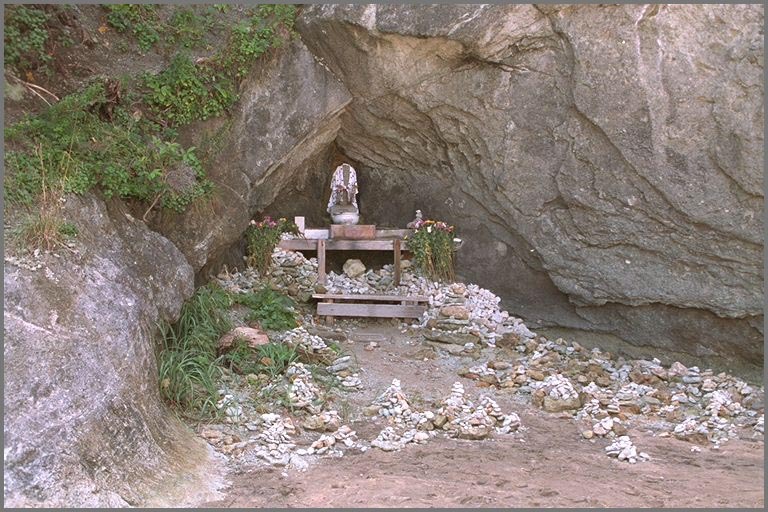 Because Jizo is the god who protects children, and he does not fail to protect them there on the banks of the Sai no Kawara. So when scared by this devil, they all jump into the sleeve of Jizos robe, where they hide and feel safe and warm. 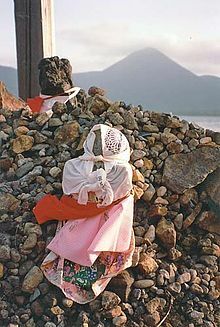 It is said that in the old days, some of the Jizo statues were covered in pebbles from people who stacked the pebbles in front of the Jizo, because it is believed, that for every tower of pebbles you build on earth, you help the souls of the dead children to perform their duty there on the Sai no Kawara.
. Sai no Kawara, the Limbo for Children . They are a phenomen in themselves during the festival. 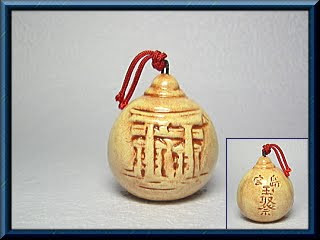 I have had one of these itako shamans call up my dead father from Germany. After a long preparation with prayers and incense, she got the contact. But my father talked through the medium, but in the almost non-understandable dialect of Tsugaru. We did not dare interrupt her. After about 30 minutes all was over. We got the advise to take good care of his grandchildren (we do not have any children), and I should take care to take a cold in the coming winter. 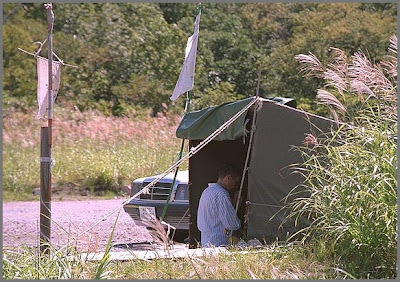 That is me in front of her tent, you can even see the tip of our car. The itako later told us, she once had foreigners asking for her service, but they interrupted her twice to ask for a translation into normal Japanese ... by the time the spirit had left her and no advise from the other realm was given to them. 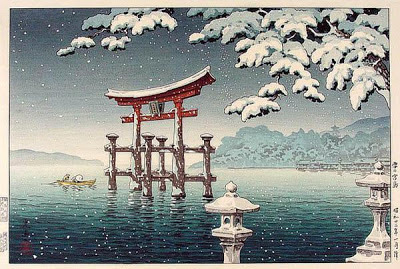 It took her a long time of apprenticeship to become an itako, with water ablutions in the middle of the cold Tohoku winter while she was only 12 years old, and studying with the priests at this temple, on how best to soothe the pain of the living, who lost a loved family member. She has a set of "advise" for the most common losses, like father, mother or a child. Also her "advise" through the kuchiyose seance depends on the time between the loss and the visit to her. She has a home on the Tsugaru peninsula where she spends a quiet winter and sits in her tent here in Osorezan during most of the summer, living a frugal life in the temple compound. 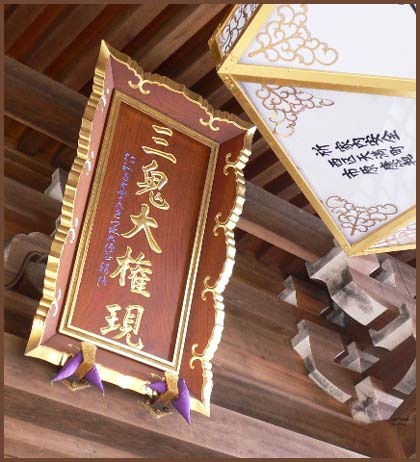 The itako play an important role in connecting the dead with their grieving relatives and provide relief by telling them the dead soul wants this or that, which the relatives can provide as an offering in the temple and feel much better afterwards. 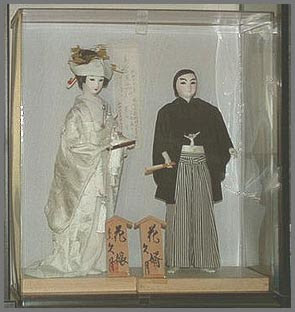 The provision of brides as wedding dolls for young men, who were lost at sea or during other accidents, is one example of solace for the berieved parents. 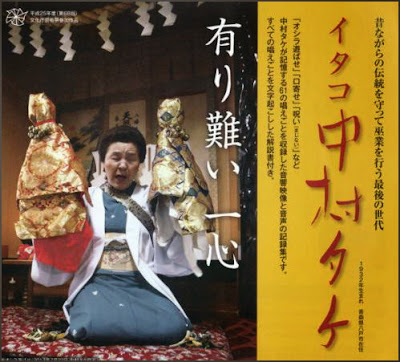 Daily Yomiuri: Why are most itako women? There are various explanations. While male shamans are common in China and Southeast Asia, female shamans are more prevalent in India, North and South Korea, and Japan, where societies are based on patriarchal values. I think shamans tend to be female in societies where women are suppressed or discriminated against as an inferior gender. By associating themselves with the gods, women are able to balance their power with men in such societies. 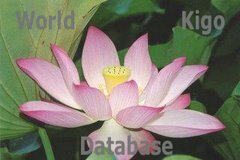 Japanese used to believe that the gods offered mercy to those in misery, especially Kannon, the Buddhist goddess of mercy. She is one of the most commonly believed-in gods among itako. 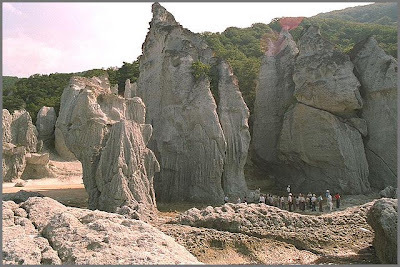 I have seen noseless yuta shamans in Okinawa Prefecture. Such physical defects used to be interpreted as symbolic of supernaturalstigmata. The oldest reference to female shamans in Japan appears in the Wei Zhi, a Chinese chronicle of the third century. A woman called Himiko, who is described as a shaman, ruled an early Japanese political federation known as Yamatai using a divine power to converse with the gods. The first reference to female shamans in Japanese writing dates backto the 11th entury. What religion do itako believe in? How is the initiation ceremony carried out? Why haven't itako been respected in the same way as priests? How can you verify that an itako has really entered a trance? Daily Yomiuri: Can itako contribute to the well-being of modern people? Shamanism can help make up for weaknesses of modern culture by providing relief for people in extreme suffering and pain, making fuller use of people's daily lives and keeping society and culture intact. Shamanism fills some of the spaces left open by modern rationalism and science. 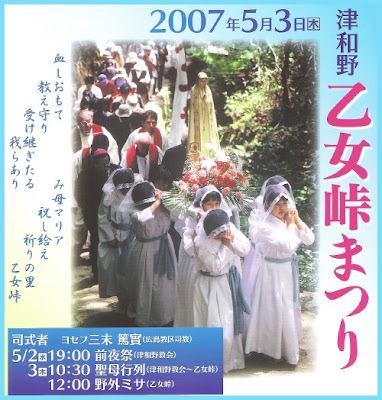 This publication "Itako Nakamura Take" consists of two DVDs with subtitles both in Japanese and English, six CDs and detailed explanatory book including the texts of all prayers in Japanese with excerpts in English. 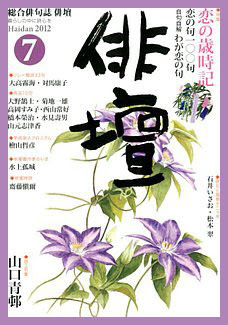 The explanatory book is written by Komoda Haruko 薦田治子 et al. and translation by Kimura Mika. This publication contains 61 chants and prayers that Nakamura Take chants in the various shamanic rituals, such as praying for the family's safety and prosperity, conjuring the dead and spell casting to cure a disease. It received the Prize for Excellence, Agency for Cultural Affairs, National Arts Festival, 2013. This is the most western part of the Osorezan Buddhist world, from here the souls take off directly to the Paradise in the West. The rough mountains look like Buddha statues and a huge area is reserved for the dead children.
. More photos in my album . Zu den mizuko, bzw. den mabiki-ko, den umgebrachten Säuglingen, und ihren roten Lätz­chen habe ich in einem Tempel folgende Er­klärung gehört: Jizō hat gelobt, alle Kinder aus der Vor­hölle zu retten. Weil Kinder noch keine Sünden be­gangen haben, kommen sie nämlich nicht direkt in die Hölle, das wäre ja un­ge­recht. Aber sie müssen am Grenz­fluss warten und während dieser Zeit Steine auf­einander schichten. Das ist ähnlich wie Sisyphos. Sie warten so lange, bis keiner mehr um sie trauert. Die Mutter bindet also eines der Kinder­lätzchen zu einem Jizō und bittet, durch den Geruch des Lätzchens das Kind in der Vorhölle zu identi­fizieren und zum Paradies zu bringen. Wenn die Mutter früher, in der Edo-Zeit zu lange trauerte, konnte sie nicht genug im Haus und am Feld arbeiten. Daher wurde ihr eine Periode von 7 Tagen nach dem Tod eines Kindes (nicht bei Abtreibung, aber bei mabiki, dem Töten eines weib­lichen Säuglings) ge­gönnt. Danach musste sie die Sachen des Kindes, Lätzchen und Spiel­zeug, bei Jizo „abgeben“ und die Trauerzeit war vorüber, Mutter musste wieder arbeiten gehen! Eine recht diesseitliche Religionsbenutzung. Um den Iwaki-san in Nordjapan werden verstorbene Kinder zu ihrem 20. Ge­burts­tag verheiratet. Die Tempel verkaufen ca. 50 cm große Puppen von Bräuten oder Bräutigamen, die dann mit dem toten Kind „verheiratet“ werden. Das macht die Eltern froh und die Tempel reich. Es ist er­staun­lich, dort in so einer Halle mit tausenden von Hoch­zeits-Puppen zu stehen! Die Itako-Shamaninnen am Osore-Berg reden den Eltern auch noch manch anderes ein — so werden Tennis­schuhe und Fahr­räder oder Frack und Regen­mantel gespendet, manche Tempel sehen aus wie Altwarenhändler. ***** . 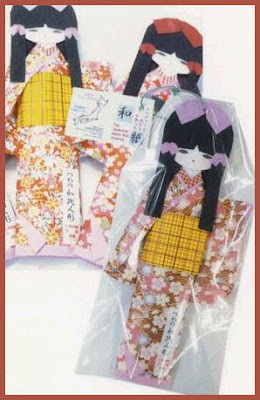 Hanayome ningyoo　花嫁人形　bride dolls .
. Sanzu no Kawa 三途の川 River Sanzu, on the way to hell . Kasuga Taisha 春日神社 in Kuwana town. It starts on the last day of July, Midnight, hence a late summer kigo. 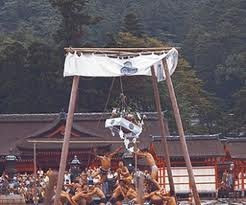 Ishidori Matsuri (石取祭) can be literally translated from Japanese as "stone bringing festival." 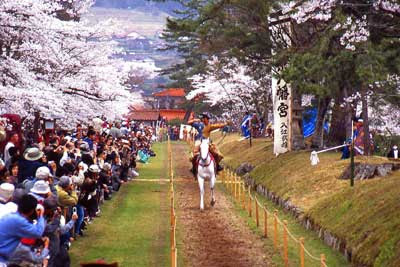 It is a festival in Kuwana, located in Mie Prefecture. The festival starts on the first Saturday of August, at midnight, and runs throughout the weekend. Every town within the central part of the city has its own 3 wheeled, highly decorative festival cart. Each cart has a large taiko drum at the back and several kane along the sides. Each town has a particular sequence for each of those instruments, creating a unique and identifying sound. 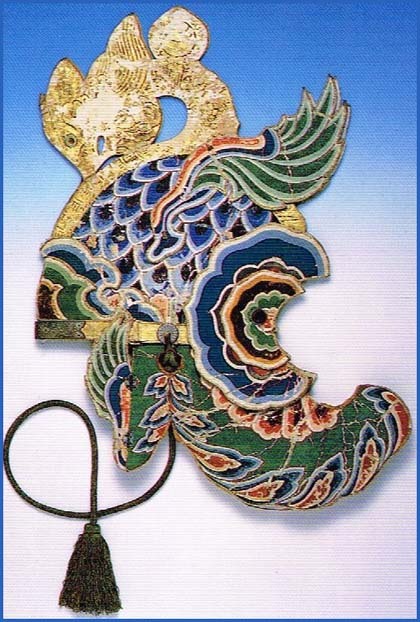 Another identifying feature is the placement of the kakegoe, or shouts. Over the course of the weekend, the carts are pulled toward Kasuga Shrine for presentation, performing along the way. With over 30 carts with distinct rhythms, it has been said that the Kuwana festival is the loudest festival in Japan. 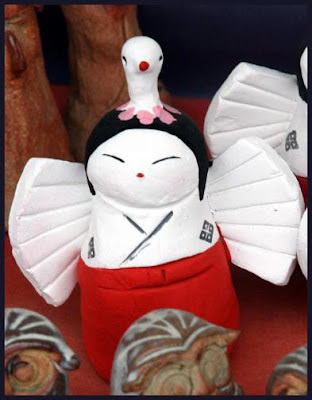 The festival originally started in the Edo period (1751-1764). 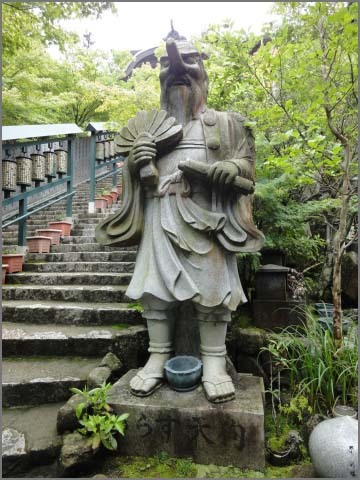 It is believed to have originated from the custom of local worshipers selecting stones from the Machiya River to take to the local shrine. The stones were ceremoniously transported to the shrine on carts, while taiko and kane were played. 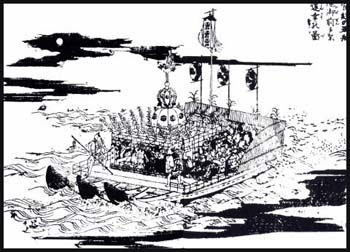 In 1981, the festival was designated as an asset of intangible culture for Mie Prefecture. 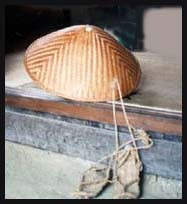 In 2007, it was designated as a national asset of intangible culture. Typically the towns are separated by age. There is a children's group, young adult group, older adult group, and senior adult group. The order of the carts is determined by lottery. This is the practice time with the festival carts. On the 20th, some carts will gather together in one particular town to end the practice session in camaraderie. They can not touch the carts again until Tatakidashi (叩き出し), which is at midnight between Friday night and Saturday morning before the First Sunday of August. Around this time, there is a gender-specific competition between the young adults of each town, though not all towns choose to compete. There is a Kawarabarai Ceremony (川原祓式) at Machiya River to pray for a safe festival. Bamboo is gathered to decorate the festival meeting places. Each age group attends their local shrine for the Okattsan Ceremony (お勝さん), which includes singing and praying. The children and adults, with the exception of the young adults, move the cart to its festival position, as was determined in March. Much later, the young adults return to the group after much drinking. Friday night leads up to Tatakidashi. At midnight, all the towns are signaled to start drumming simultaneously. After playing into the early hours of the morning, the group will retire, typically meeting once more at 10am. The festival carts are paraded through their towns on this day, and once again it leads up to silence, awaiting the next Tatakidashi. At 2am, there is another Tatakidashi. The taikos and kane start playing simultaneously and the carts are paraded around their town for another long night of celebration. The day is very similar to the previous one. During the day on Sunday, the young adults drink while once again the others put the cart into its specific order. Later, the young adults join in, and each town makes its way to Kasuga Shrine. Often called "Kasuga san" 春日さん by the locals. at Riding Ground, Tado Taisha Shrine, Kuwana-shi. 11:30 A.M. A man on horseback equipped with a bow and arrow takes three consecutive shots at a target in accordance with Ogasawara School of etiquette.
. Tado-Taisha 三重 多度大社 . ***** . 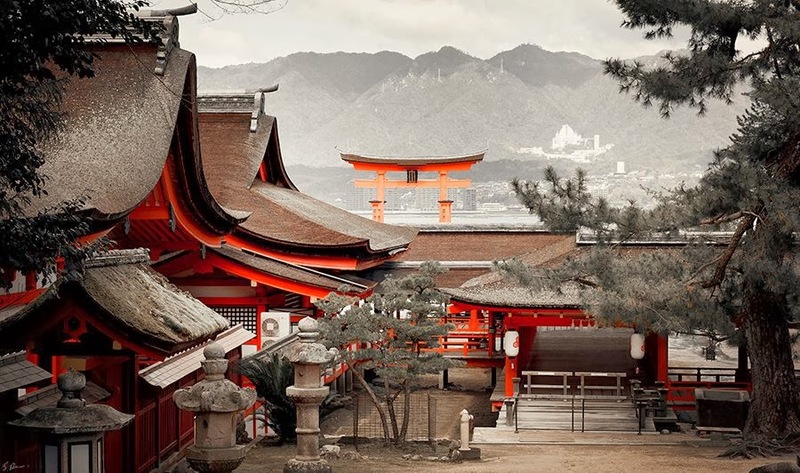 OBSERVANCES – SUMMER SAIJIKI .
. Grand Kasuga Shrine (春日大社, Kasuga-taisha) . July 20 ご神幸の日 and 27 ご還幸の日. Since 1542, when Daimyo Yoshimi Masayori 吉見正頼 (1513 - 1588) introduced it. The decoration on the head weighs up to 15 kg. 12 children perform a dance 子鷺鉾. the Sagi Mai is performed as part of Tsuwano's Gion Matsuri. Though known as the Heron Dance, the birds being imitated are in fact Egrets. The dance, like the Gion Matsuri itself, was originally from Kyoto, but during the time that Kyoto was a burned out, war-destroyed, ghost town many aristocratic refugees fled to Yamaguchi, and it was from here that the dance was introduced into Tsuwano. The people of Tsuwano faithfully kept the dance in its original form and in 1953 they went to Kyoto to teach the dance and it is now performed there again. As well as the 2 dancers dressed as egrets, there is a full complement of other dancers, musicians, singers etc all dressed in period costume. 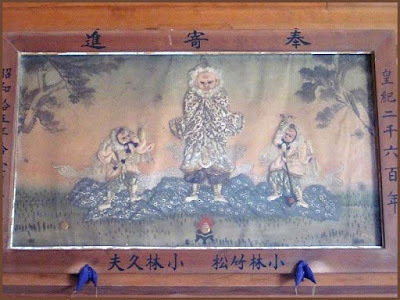 The music accompanying the dance seems to be based on ancient Chinese-derived court music rather than any folk tradition. 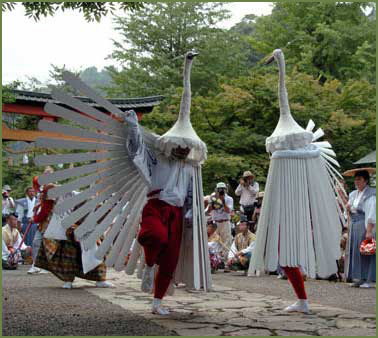 Also performed is the Egret Chick dance, a recent invention of the town. The young girls didnt smile much, which may be due to the solemnity of the dance, or the summer afternoon heat. This folk ritual performance is a type of furyū dance also known as sagimai. 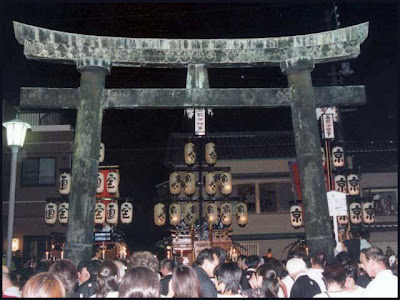 Sagi-odori originated from dances performed to musical accompaniment at Kyoto's Giongoryōe observances, which evolved into the festival of the city's Gion Shrine (now called Yasaka Jinja). 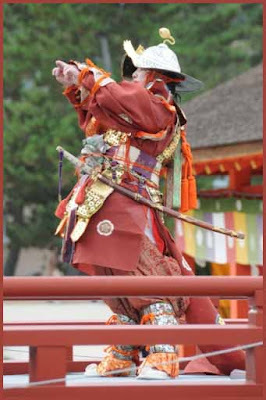 During the Muromachi period the dance spread around Japan as the national influence of the Gion Shrine grew and festivals based on the Gion gyoryōe were disseminated throughout the country. A sagimai is performed as part of the July festival at the Yasaka Shrine in Tsuwano, Shimane Prefecture. 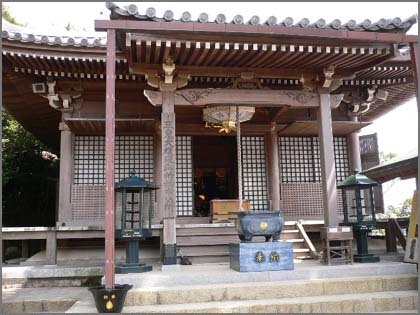 The shrine was originally called Gion Shrine. 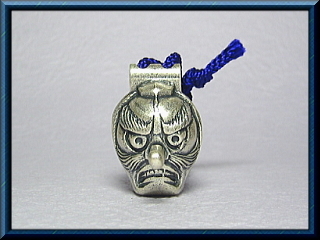 The sagimai performed there is said to have come from the Gion goryōe of Yamaguchi during the Temmon era (1532-1555). It was subsequently discontinued, only to be revived in the seventeenth century on the model of the Kyoto observances. 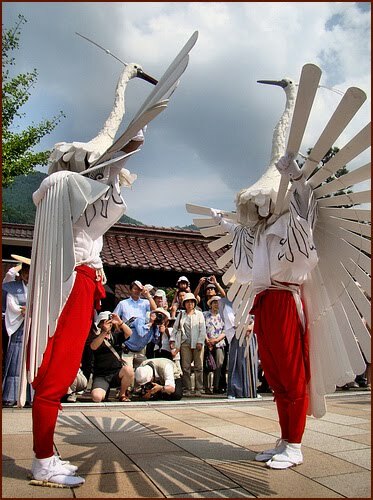 The Tsuwano sagimai is performed by two dancers, both of whom wear wooden headdresses made to resemble the sagi (heron) and have wooden wings attached to their shoulders. The dance is performed to the accompaniment of music (flute, tsutsumi hand drum, taiko drum, and bells) and singing. The dancers are accompanied by two baton twirlers and two players of small kakko drums. 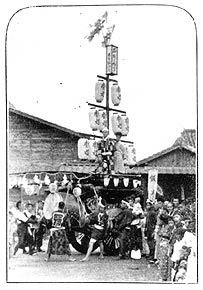 Decorative large and small umbrellas (kasaboko) are also brought out as part of the dance. The Yasaka shrine in Tsuwano is a branch of the Yasaka Shrine in Gion. Originally known as Mototakimoto Gionsha, it was part of the importation of kyoto culture by the lords of Tsuwano. 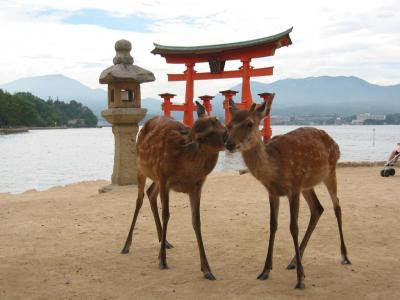 Its located on the riverbank below the castle and the Taikodani Inari Shrine. For most of the year it seems to be abandoned and not much goes on there. There is a wonderful huge tree in the grounds though.
. Heron Dance Clay Bell .
. mamecha 豆茶 "tea from beans" / zaracha ざら茶 .
. Genjimaki, Genji-maki 源氏巻 "Genji-Rolls" . is a town in Kanoashi District, Shimane Prefecture, Japan. Tsuwano is remotely located and surrounded by hills. 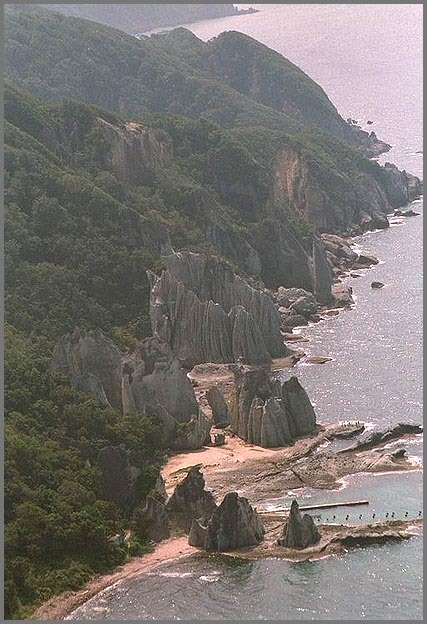 Though geographically closer to Yamaguchi, the capital of Yamaguchi Prefecture, it is situated in Shimane Prefecture. Popularly called the "Little Kyoto of San-In," Tsuwano is known for its picturesque mainstreet, "Tono-machi," which is lined with Edo-era buildings and Koi ponds. 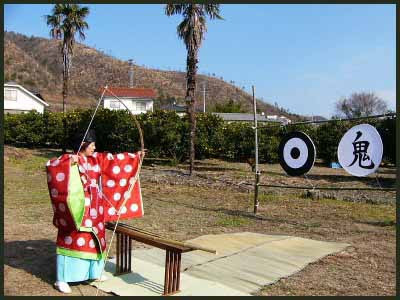 It also boasts one of the oldest still in use "Yabusame" (horse back archery) ranges in all of Japan, and its annual Yabusame festival is a large tourist draw for the San-In region. Tsuwano is somewhat unusually home to two Catholic churches. The Catholic church in Tsuwano itself is dedicated to Saint Francis Xavier, who visited Japan as a missionary in 1549–50, and is located on its mainstreet. The church at Otome Pass is part of a memorial for Christians persecuted and tortured in Tsuwano by the government during the Edo and Meiji periods. Other notable locations and tourist attractions within Tsuwano include the ruins of Tsuwano Castle. Novelist Mori Ogai was born in Tsuwano into a family of doctors, and the house of his birth is preserved. His tomb is located in Yomei Temple in Tsuwano, which was built in 1420 and is known as one of two great Sōtō sect temples, the other being Daijo-ji Temple in Kanazawa city.
. WKD : yabusame 流鏑馬（やぶさめ）Yabusame . ***** . Heron (aosagi) Egret (shirasagi) .